Teams riding impressive winning streaks collide Sunday when No. 12-seed Oregon plays 13-seed UC Irvine in a West Regional second-round game. It's a 9:40 p.m. ET tipoff from SAP Center in San Jose. The Ducks have won nine straight after upending Wisconsin, 72-54, in their 2019 NCAA Tournament opener. Meanwhile, the Anteaters have reeled off 17 victories in a row after upsetting Kansas State, 70-64, behind the dynamic backcourt duo of Evan Leonard and Max Hazzard. Sportsbooks list the Ducks as 4.5-point favorites in the latest Oregon vs. UC Irvine odds, with the over-under for total points set at 122. 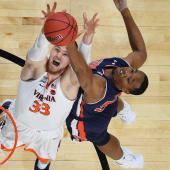 Both teams are on fire and playing ferocious defense, so before you make any Oregon vs. UC Irvine picks, you'll want to see the 2019 NCAA Tournament predictions from SportsLine's Mike Tierney. A renowned sportswriter whose work appears periodically in the New York Times and L.A. Times, Tierney is a West Coast-based SportsLine hoops expert who has his finger on the Ducks' pulse. Amazingly, he's 8-0 in his last eight picks involving Oregon. Anyone who has followed his lead is way up. Now, Tierney has analyzed Oregon vs. UC Irvine from every possible angle and locked in a strong pointspread pick. He's only sharing it at SportsLine. Tierney knows the Ducks took the Pac-12 by storm with a stunning run to the conference tournament title. Junior point guard Payton Pritchard scored 19 points in the dismantling of Wisconsin after being named the Pac-12 Tournament's Most Outstanding Player. Over his last three games, he's made or assisted on 60 percent of Oregon's field goals. The Ducks have forced 14.8 turnovers per game during their winning streak and covered in all nine victories. But just because the Ducks have fattened bettors' wallets lately doesn't mean they'll cover the Oregon vs. UC Irvine spread and advance in the 2019 NCAA bracket. The Anteaters allow just 63.3 points per game, 19th-fewest nationally, and just held 4-seed Kansas State to 37.3 percent shooting while forcing 13 turnovers. UC Irvine is 12-3-1 against the spread in its last 16 games and boasts a pair of deadly 3-point shooters in Leonard (41.2 percent) and Hazzard (39.7 percent). UC Irvine sports the nation's longest winning streak -- they're 20-1 this calendar year -- and is a perfect 8-0 in games decided by five points or fewer. We can tell you Tierney is leaning under, and he's also identified a striking trend that makes one side of the spread a must-back. He's only sharing what it is, and who to back, at SportsLine. So who wins Oregon vs. UC Irvine? And what striking trend makes one side a must-back? Visit SportsLine now to see the strong pointspread pick for UC Irvine vs. Oregon, all from the renowned sportswriter and expert who's 8-0 picking Ducks games.